If you wind up procrastinating this holiday season and need a late Christmas gift for a TV lover in your family, Showtime's Shameless will be there for you in your time of need. Warner Home Video has announced that the show's first season will be arriving on Blu-ray and DVD on December 27th. You might think it would make more sense to put it out before Christmas, but that's just typical of the Gallaghers. If you never caught Shameless during its run earlier this year, you may still have heard it referenced online as "that show where Emmy Rossum gets really, really naked on a regular basis." Fortunately, if Emmy Rossum's unmentionables aren't enough to lure you in, the show also happens to be pretty damn funny. 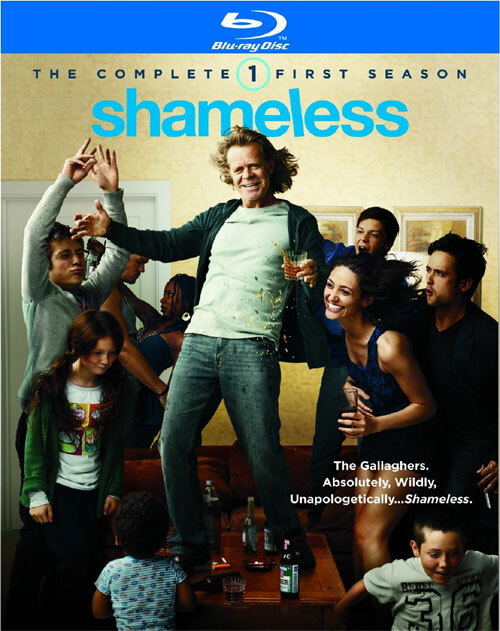 Based on a British show of the same name, Shameless tells the story of the dysfunctional Gallagher clan, a dead-broke Chicago family who struggles to make ends meet, even as their patriarch, the alcoholic Frank (William H. Macy), struggles to stay drunk at all times. Emmy Rossum plays Fiona, the eldest Gallagher child, and the one saddled with keeping the family running while Frank stumbles about in a booze-soaked haze. The show is exec produced by TV veteran John Wells (ER, The West Wing). The show deftly balances dark humor and more dramatic moments, and never attempts to blunt the harshness of the Gallaghers' poverty-stricken existence or Frank's horrible parenting. Rossum is stellar is a young woman who's had to grow up too fast thanks to ineffectual or absent parents, and is now simply trying to carve out something for herself in the world. If you missed it during its run, I can't recommend the DVD release highly enough. Well, that's not quite true. So far the listings for set don't mention any bonus features at all, so fingers crossed that it's simply an oversight. At any rate, the show will be well worth your $49.99 on Blu-ray or $39.98 on DVD. Shameless will return to Showtime for a second season on Sunday, January 8th, 2012.